So this symphony lover invites me to a concert, a box seat, up over the orchestra. It’s cold. Chicago. The violinists warm up. The whole northern hemisphere keeps trying to warm up to spring. From anywhere in the building, you can see the guy up front, the conductor. Somebody’s ironed his black threads pretty smooth. His hair – not so much. It’s this perfect balance of grace. It is Easter afternoon and two disciples are walking the road to a village called Emmaus. They are discussing the events of the weekend when a stranger comes near. It is Jesus, although they don’t recognise Him. They tell Him about Jesus, His crucifixion and the reports of His resurrection. Jesus then starts to tell them about how it was necessary for the Messiah to suffer then enter into glory. At he village, the disciples invite Jesus to stay the night. When they are eating, Jesus takes the bread, blesses and breaks it. Their eyes are opened to recognise Him, then He vanishes. Excited, they rush back to Jerusalem with the news that they have seen the Lord. An encounter with Jesus will burn our hearts within us. Drawing close to Jesus, communing with him, listening to Him- this is what warms the heart of the true follower of Jesus. There are three things happening here. 1. Two disciples sharing together about Jesus are joined by Him unexpectedly. Where two or three are gathered in His name He is there. I love cell groups and one-on-one conversations because, as we share about Jesus, He comes and joins the conversation. 2. Jesus talked to them. We need to learn to listen to the still small voice of God. He tells us, ”My sheep know my voice.” The greatest source of life for christians is the voice of the Living Word that comes to us as we listen in prayer. 3. He opened the scriptures to them. All scripture points to Jesus. It can be so easy to come to God’s word as a religious chore that we tick off our daily “to do” list. Here is the word of eternal life. It deserves our attention. We need to learn to hear the voice of Jesus opening the scriptures to us, opening our understanding and our eyes to see how it applies to us today. Lord Jesus, when I come into your presence, my heart truly does burn within me. I confess that I sometimes let the busy-ness of life prevent me from seeking you. Let my heart burn with passion for your presence. Amen. The Amazing Wax Worm Eats Plastic! Scientist and amateur beekeeper Federica Bertocchini picked parasitic wax worms from the honeycomb of her beehives and left them sitting in a plastic bag. When she returned to the bag, it was riddled with holes and many of the worms had escaped. It was that chance discovery that led her to collaborate with scientists at the University of Cambridge in England to unearth the possibility of using worms to munch through the world’s plastic problem. The team discovered the wax worm, a caterpillar commercially bred for fishing bait, has the ability to biodegrade polyethylene — a type of plastic used to make shopping bags — at uniquely high speeds. The degradation rate was extremely fast compared to other discoveries, like plastic-eating bacteria, the study published in Current Biology found. When the team exposed about 100 wax worms to a plastic shopping bag, holes started to appear after 40 minutes, with a reduction of 92mg after 12 hours. To compare: plastic-eating bacteria biodegraded plastic at a rate of 0.13mg a day, and it takes 100 to 400 years to degrade polyethylene in landfill. Analysis showed the wax worms transformed the polyethylene into ethylene glycol, a chemical used to make polyester and anti-freeze. 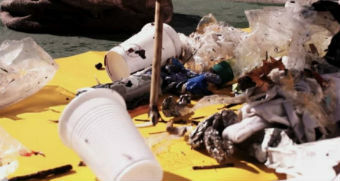 The team of three scientists said the discovery could lead to a biotechnological approach to plastic pollution. People around the world use about 1 trillion plastic bags each year, the study said, and more than 45 million tonnes of polyethylene plastics are produced annually. “The caterpillar produces something that breaks the chemical bond, perhaps in its salivary glands or a symbiotic bacteria in its gut,” said Cambridge University’s Paolo Bombelli said. Wax moths lay their eggs inside hives where the wax worms grow on beeswax. The worms are known for living like parasites in bee colonies and damaging hives by eating their wax comb. Plastic rubbish will outweigh fish in oceans by 2050 unless the world takes drastic action to recycle the material, a report has warned. Researchers said breaking down plastic and beeswax required similar types of chemical bonds. “Wax is a polymer, a sort of natural plastic, and has a chemical structure not dissimilar to polyethylene,” Ms Bertocchini, from the Spanish National Research Council, said. When the team mashed up the worms and smeared them into plastic they had similar degradation results to when the caterpillar “ate through” the plastic. “The caterpillars are not just eating the plastic without modifying its chemical make-up. 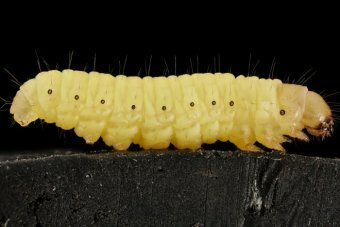 We showed that the polymer chains in polyethylene plastic are actually broken by the wax worms,” Mr Bombelli said. You have been born anew, not of perishable but imperishable seed, through the living and enduring word of God. If we call God “Father” we should live in reverent fear. We were ransomed from the ways of our ancestors through the precious blood of Christ. He was destined to die before the foundation of the earth and is now revealed at the end of the age. We have been born again with an imperishable seed through the living and enduring word of God- the good news that was announced to us. Our first birth was in the flesh or from a perishable seed. Tainted by the spirit of death that now pervades the cosmos, we too were destined for death. The sin of Adam, passed through the generations, put us on the road of death. Our own sins cemented us on the road. Then came Jesus, the perfect sacrifice. He took away the power of sin and death. We were born again to a living hope through the imperishable seed of Christ’s death. “Born again” does not just mean a new start or a second chance,although it does include that. It really means an entirely new nature. The Holy Spirit brings spiritual life, living water that washes away the power of sin in our lives. Because I am born again and filled with the Holy Spirit, I have a new connection with God through the Holy Spirit in me. I can talk to Him any time without going through priests or cleansing sacrifices and rituals. The vehicle for this process is the living and enduring word of God. This takes four different but related forms. The written word of God is inspired or God-breathed, and so it always caries the life of the Holy Spirit. The Word of God is of course Jesus Christ Himself (see John 1). He embodies the message of Scripture, the word become flesh. Every word of Scripture is ultimately about Him. Revelations from the Holy Spirit- words of knowledge and wisdom, prophecy etc. This is a lesser form of the word because it is so easily corrupted by our sinful nature. It must always be corroborated by the written word or the Living Word. It should not be dismissed because God still speaks to His people today. Lord Jesus Christ, the Living Word, may I hear your word in its various forms and respond always to your love and your will for me. Amen. This is a very worrying trend in a nation which has, in the past, been verytolerant of diverse beliefs. The Wahid Foundation, an organization that promotes tolerance in Indonesia reports on acts of sectarian violence. The former first lady of Indonesia, Sinta Nuriyah Wahid, cited some alarming statistics from the Foundation’s research saying that, “Only 11 per cent of respondents expressed strong rejection of the idea of establishing an Islamic nation,” and adding that, “59 per cent of Indonesians who responded to the survey carried out acts of intolerance towards non-Muslims.” Indonesia has been under the growing influence of conservative Islam which is resulting in more acts of intolerance against non-Muslims. 4/25/2017 Indonesia (Asia News) – Sectarian acts against non-Muslims are rising fast, this according to a study by the Wahid Foundation, an organisation that promotes a tolerant and multicultural society in Indonesia. The Wahid Foundation was set up to support the humanitarian vision of Abdurrahman Wahid (Gus Dur), a moderate Muslim intellectual and a former president of Indonesia, who, during his political career, promoted an inclusive version of Islam. As president, and as leader of the Nahdlatul Ulama, a Muslim movement, he promoted the rights of minorities, non-Muslims and Indonesian Chinese. His widow, Sin Nuriyah Wahid, raised the issue of intolerance during a television interview on 10 April. The former first lady cited the Foundation’s study to warn her fellow citizens and her words continue to echo. The results of local elections in Jakarta on 19 April, which saw the victory of Anies Baswedan and radical Islamist groups, re-ignited the debate. Peter finishes his Pentecost address to the gathered crowd by declaring that Jesus is Lord and Messiah. The people are cut to the heart by his message. They ask, “What should we do?” Peter tells them they must repent and be baptised for the forgiveness of their sins. Then they will receive the gift of the Holy Spirit. So Peter continues to exhort them, and three thousand people receive the message and are baptised. God calls on us simply to repent and be baptised. All we have to do is turn from our sins in response to the gospel. Baptism is the outward sign that we have died to our old nature and risen to new life in Him. A simple step of faith accepting that He is Lord of all. All my sins are gone, washed away by the blood of Christ, deleted from the record, all because of God’s grace given to me in Christ. Because I am so weak and unable to live God’s way in my own human strength, He places His Spirit in me. My decision to follow Jesus activates a whole new life, a gift from God. And it’s not just for those who were immediately hearing Peter’s message that day so long ago. It is for everyone, for those who are near and for those who are far away- in space and time. Everyone who call son the name of the Lord Jesus Christ will be saved. Thank you Lord for reaching down to me. I was lost in my sin, but you brought me home to you. Thank you Lord that your grace is even bigger than my sin. Amen. Due to problems with our sound gear, we were unable to record this morning’s sermon.